Whether it is for promoting a site, a product or a website online or just showing what you personally like – a video, news, a photo or just about anything, Yahoo! Meme can just be what you need it to be for you. This is another service of Yahoo! that anyone can use whether they have an account with Yahoo or they do not have one yet. 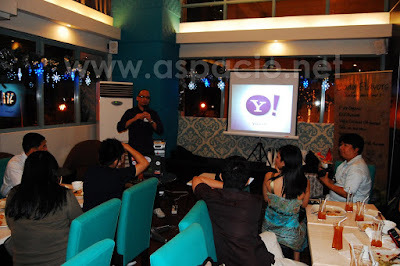 Users of Yahoo! Meme can avail of their service and build their own profile. I personally have used Yahoo! Meme, under Jeff Aspacio – Meme, for promoting new blogs, advocacies and projects, the latest of which was Camp Kabataan’s Synergy 2009 event. With some friends that I have followed in Yahoo! Meme I also was able to discover things to enjoy and appreciate like the photos of a friend blogger, Azrael who shared his lovely photos of the feast at Quiapo, Manila. I discovered this after attending the Blog4Reviews Christmas party. As its name suggests, Yahoo! Meme can be a meme for anyone who wants to spread something rapidly in the web. It is an enjoyable tool but at the same time, a pass time for those who use it. You can start by visiting Yahoo! Meme and creating an account if you do not have Yahoo account yet and you can start using it right away. Seems cool, I guess I should create one for myself. 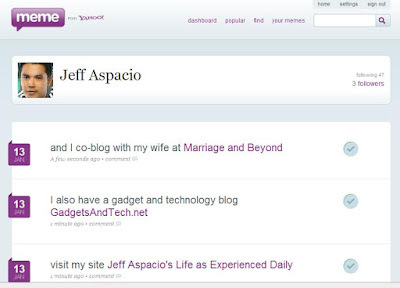 @Yodz: I'm glad you liked it, I'll follow you on Yahoo! Meme please follow me too. @Claudia: Thanks for the information and for bookmarking my blog and sharing it with your friends. Hi Jeff. Thanks for attending the Blog4Reviews party.